You can’t be the best until you’ve passed every test. - Endura Products, Inc.Endura Products, Inc.
You can’t be the best until you’ve passed every test. Testing at Endura goes beyond the basic requirements. We think of real world problems our industry faces every day, and create tests to ensure that our products are up for the challenge while outperforming all others. Z-AC has been extensively tested and proven to outperform every other sill on the market, even in less-than-ideal situations. Z-AC has undergone Comprehensive Independently Certified Testing, revealing higher Design Pressure (DP) ratings than any other sill, including areas prone to severe weather. Plus, Z-AC sills and door bottoms have been strenuously tested for durability, undergoing and standing strong through a minimum of 25,000 cycles and delivering real-world performance you can count on, now and in the years to come. 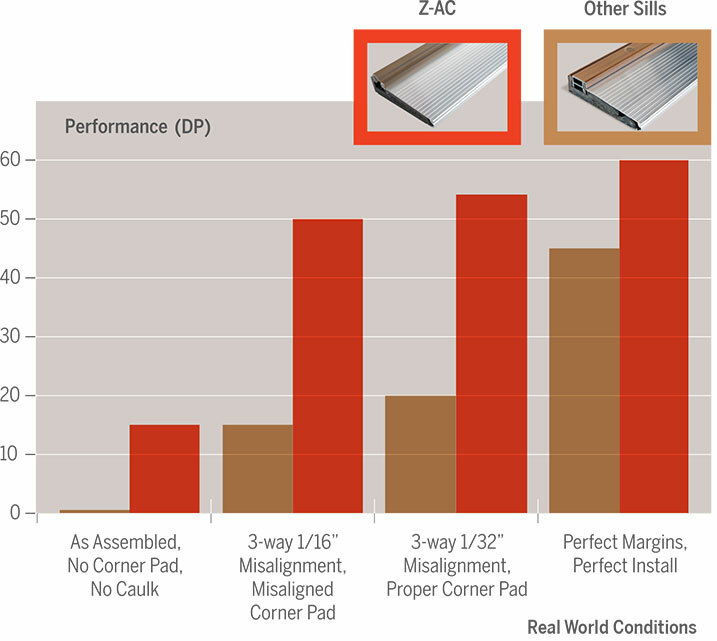 Even in real-world conditions where margins are wide and corner pads are missing, Z-AC delivers higher performance in protecting against air and water infiltration. Real World Testing. Real World Performance. 2019 Endura Products, Inc.. All Rights Reserved.